During nearly 25 years presence in Vietnam, with a sustainable business strategy, Coca-Cola has asserted its leadership in the beverage industry as it has been honored with numerous prestigious awards. 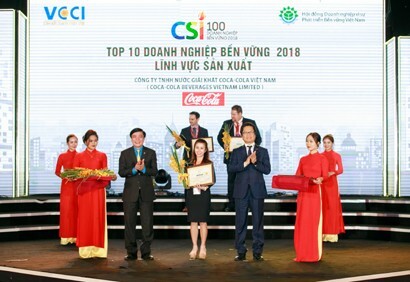 Recently, Coca-Cola Vietnam was named runner-up on the list of most sustainable companies in the manufacturing sector at the Announcing Ceremony for Sustainable Companies in Vietnam in 2018. In the past years, Coca-Cola Vietnam’s sustainable development strategy has been carried out strongly in both business and social aspects. From the business perspective, the firm focuses on intensive business investment, particularly technological investment. Accordingly, since 2013, Coca-Cola has invested much in production facilities powered by the most advanced power-saving and environment-friendly technologies. Integrating business with environmental protection, Coca-Cola Vietnam has also embarked on building a smart factory model. Fueled by green energy, the factory is innovatively integrated information technology in production management, digitalization, database synchronization and smart sensor systems to control quality indicators, and create self-contained production processes to make high-quality products. The entire production line is automated and controlled by robots. The warehousing system is also applied with the smart technology to enable automated export and import as well as the transport management system integrated with a global positioning system to make freight transportation more convenient. In addition, with the vision of becoming a beverage brand for all, Coca-Cola constantly researches and improves formulas to introduce a wide range of premium products to Vietnamese consumers in modern life. In October 2018, Coca-Cola Vietnam officially launched instant coffee Georgia Coffee Max made from premium Robusta coffee cultivated in the Central Highlands of Vietnam. The product is a testament to Coca-Cola's understanding of Vietnamese consumers' needs and habits so as to bring the experience of a global product of typical Vietnamese flavor, dedicated to Vietnamese people. With that meaning, Georgia Coffee Max instant coffee quickly won the trust of consumers across the country, especially young people, who have active lifestyles, positive thinking and eagerness to try new experiences. In addition to beverage products that are already familiar and popular in the market, the continuous launch of new products, ranging from fruit juice, fruit milk, tea and sports drink to instant coffee, partly demonstrates Coca-Cola’s strategy for product innovation and diversification to meet the strong growth and diversity of the Vietnamese market. This is also a vivid testament to Coca-Cola's development strategy of a global brand that has clear local knowledge. Not only seriously doing business, the environment-based sustainability strategy of Coca-Cola Vietnam is also clearly expressed by meaningful community programs aimed at delivering positive values ​​to society and improving people’s life quality. Particularly, Coca-Cola Vietnam has carried out many programs to support Vietnam's economic growth and development objectives, ranging from improved access to clean water for people across the country to the program that supports local capacity building, the program that assists Small and medium-sized enterprises to enhance their competitiveness and engage in global value chains and the program that promotes women's empowerment aimed to help women succeed in business. By the end of 2018, the flagship EKOCENTER Community Support Center Program has been expanded nationwide with 11 centers, integrated with Coca-Cola’s sustainability priorities of Water, Women, Wellbeing and Plastic Waste management. The program aims to improve the community capacity and operation development and create sustainable economic values. In the coming time, the EKOCENTER expansion journey will be expanded to many provinces and regions throughout the country to spread joy and raise living quality for Vietnamese people. In addition, in 2018, Coca-Cola announced the global goal of a “World without Waste” aimed to collect and recycle 100% of packages it uses by 2030. Knowing that environmental protection requires an inclusive approach, in Vietnam, Coca-Cola is working with UNESCO, the British Council, VCCI and civil organizations to join hands with the Government of Vietnam to raise awareness and educate the public on plastic waste management towards public-private partnership with the Government, nongovernmental organizations and businesses. Typically, the educational program within the framework of the “Clean drinking water for Vietnamese schools in 2018” project was recently launched in Da Nang City and this project attracted the attention of students and local people as a whole. These activities illustrate the commitments of Coca-Cola and its partners to collect, sort and recycle plastic in the circular economy for better changes in plastic waste management. Ms. Le Tu Cam Ly, Legal and External Affairs Director of Coca-Cola Indochina, said, as one of sustainable businesses in Vietnam, Coca-Cola clearly understands the responsibility in spreading thought, perception and experience sharing to the domestic business community so as to further strengthen its position as an important and reliable partner. Based on the core values ​​of “Global Brand, Local Knowledge,” Coca-Cola has been supporting the capacity building for the domestic value chain to join global supply chains. 80% of Coca-Cola’s suppliers are Vietnamese which account for up to 70% of its costs of goods sold. In addition, community-based programs like delivering clean water to the community, empowering local women, and collecting and recycling waste are still carried out by Coca-Cola, non-governmental organizations and local governments to bring positive changes to local people. “Understanding Vietnamese culture and people, constantly researching and improving formulas to make premium products, fully meeting the different needs and lifestyles of Vietnamese consumers, always striving to bring new values ​​for life and continuously devoted to social progress and development are the core factors that build up the sustainable development of Coca-Cola Vietnam for nearly 25 years,” hesaid.